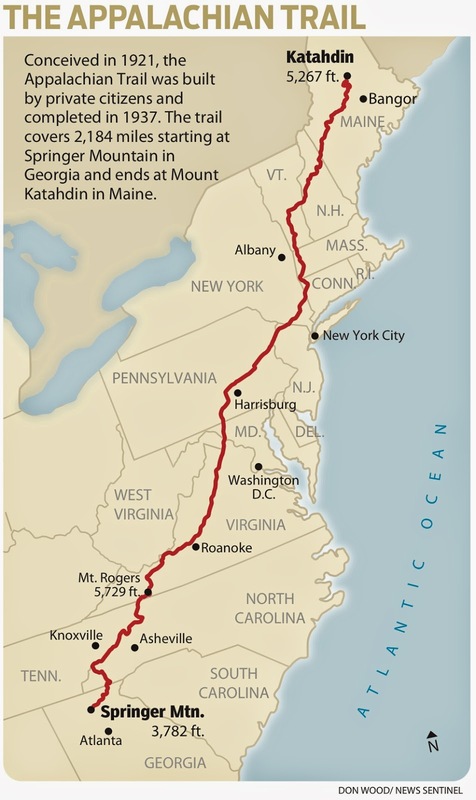 The Appalachian Trail, better known as the AT, is the longest hiking-only footpath on the planet. It spans almost 2200 miles from northern Georgia, to Baxter State Park in northern Maine. It winds and climbs through 14 states: Georgia, North Carolina, Tennessee, Virginia, West Virginia, Pennsylvania, New Jersey, New York, Connecticut, Massachusetts, Vermont, New Hampshire, and Maine. It is the first of the North Americas "big 3' long distance trails. MOST thru-hikers start with this trail due to its proximity to so many towns and the population of the East coast. the elevation gain/loss while hiking the AT is nearly the same as hiking up and down Mt. Everest from sea-level 16 times. you cross some type of road on average of every 4 miles. the highest point on the entire trail is on top of Clingmans Dome, in the Great Smoky Mountains in Eastern Tennessee, and maxes out at the elevation of 6644.
the trail cuts through what is arguably the oldest mountain range on the planet, predating even the creation of the now North America Continent.